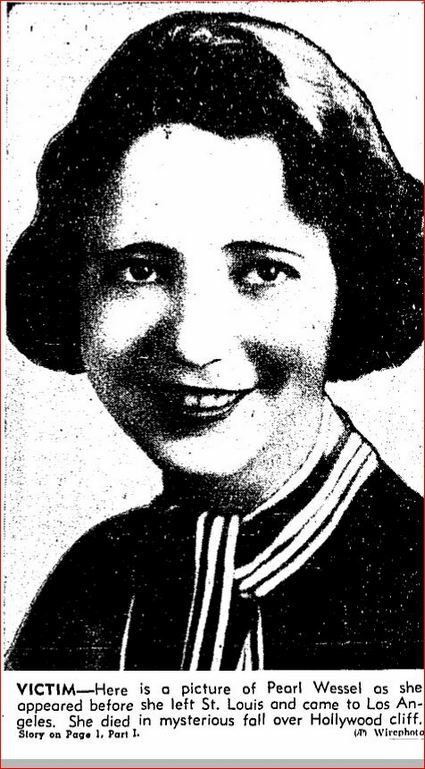 By December 1927 twenty-three-year-old Ruth Malone had been in Los Angeles for about 4 months. 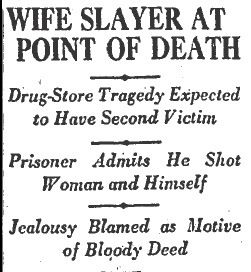 She’d fled Aberdeen, Washington to escape her husband John, a jealous and violent drunk. She used her mother’s address at 244 North Belmont Avenue, but lived with a girl friend in an apartment at 9th and Flower. She kept the address of the apartment a secret just in case John tried to find her. 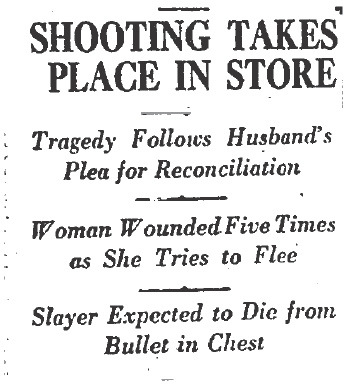 She worked half a mile from the apartment at a drug store on East Twelfth between Santee Street and Maple Avenue. Ruth had spent the last few months seriously contemplating divorce but she wasn’t in any hurry to confront John. It was 11 o’clock on the morning of Wednesday, December 7, 1927 and Ruth had started her work day when John turned up. She hadn’t even known he was in town. He was obviously drunk and made a scene. He wanted Ruth to come back to him, but she wasn’t interested in a reconciliation and John stormed out. He returned at noon and began to plead with Ruth. Again she accused him of being drunk. He copped to it–in fact he said that he’d been drinking for three weeks straight and would stay drunk until Ruth agreed to come back to him. She refused. He pulled a revolver from his pocket. Ruth clocked it and made a dash for the rear of the store. 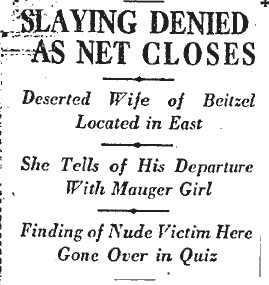 Her escape route was cut off by some partitions–she was trapped. As twenty people watched John began firing and each shot hit its mark. Ruth was hit in the chest, face and hip. Satisfied that he’d killed her, John turned the gun on himself. One bullet entered his chest a few inches above his heart and then he raised the weapon to his head and fired. The police were called and when Detectives Lieutenants Hickey, Stevens and Condaffer, of the LAPD’s Central Station Homicide Squad arrived they found Ruth dead and John nearly so. Detective Hickey was shocked when John summoned the strength to say “I’m sorry I killed her, but give me a smoke before I croak, will you?” Hickey later said that even though John believed he was dying his first thought appeared to be of a cigarette. The detectives also found an incoherent note in John’s pocket, the ramblings of a man driven to murder by jealousy and gin. Investigators learned that John was 29-years-old and that he had an arrest record. He’d been busted in Oakland on October 10, 1917 on a burglary charge and later in San Francisco for violation of the State Poison Act (a drug charge). John had been in Los Angeles for a few weeks. He was staying at a hotel just a few blocks away from Ruth’s workplace. As John lay in a bed in General Hospital fighting for his life, a Coroner’s jury charged him with Ruth’s slaying. If he lived he would be tried for her murder. Ruth was buried in Graceland Cemetery following a private funeral at Mead & Mead undertaking parlor. 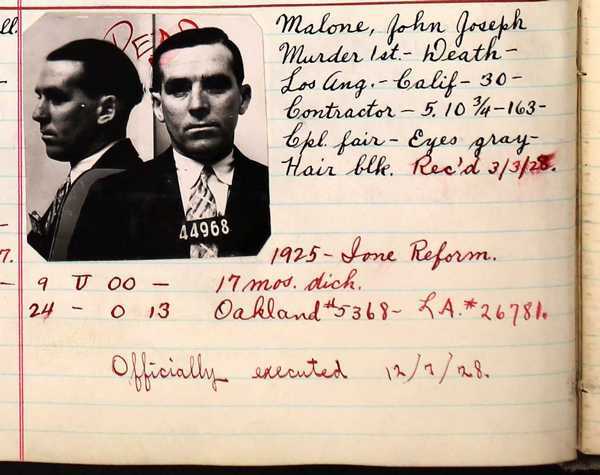 It was touch and go for a few weeks but John pulled through and by February 1928 he was well enough to stand trial. L.V. 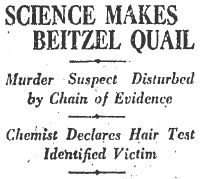 Beaulieu, his court-appointed attorney, unsuccessfully attempted to use John’s three week long drinking spree as an excuse for the murder but the judge sustained the prosecution’s objections. Alcohol induced amnesia was a poor defense strategy. The jury quickly returned a guilty verdict with no recommendation for leniency. Under the law Judge Fricke had no alternative but to sentence John to be hanged. He was transported to San Quentin to await execution. 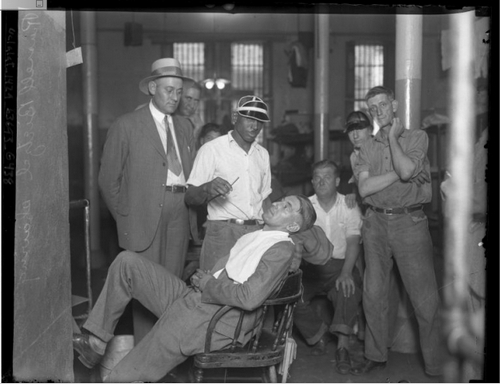 On March 20, 1928 John and several other death row inmates welcomed a newcomer to their ranks, William Edward Hickman. Hickman, who had given himself the nickname “The Fox” had been sentenced to death for the brutal mutilation murder of 12-year-old Marion Parker, a crime he had committed only ten days after John had killed Ruth. 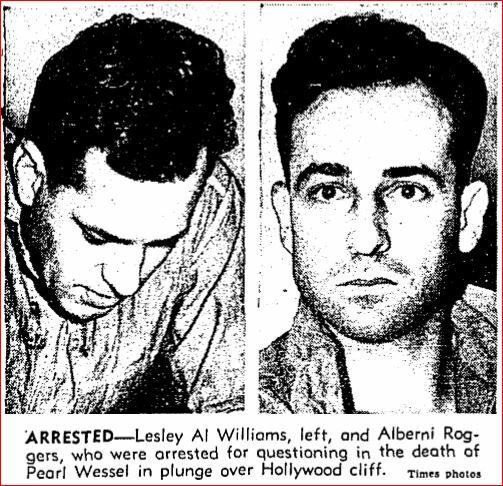 The two dead men walking had met in the Los Angeles County Jail while each was awaiting trial. John cornered Hickman on one occasion and blamed him for inciting the public to a renewed interest in capital punishment–resulting in his own date with the hangman. John’s sentence was automatically appealed but the State Supreme Court upheld the death penalty. Judge Fricke re-sentenced John to hang. Unless something changed he would meet his end on December 7, exactly one year to the day since Ruth’s murder. John had evidently changed his mind about dying since his suicide attempt because he was part of a Thanksgiving escape plot that failed. 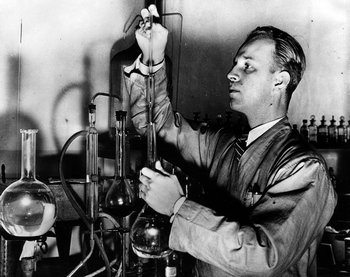 To prevent him from any further attempts to tunnel out of San Quentin he was moved to the death cell. As a condemned man, John’s final requests were honored. He was given a record player and listened repeatedly to “I Want to Go Where You Go” until it was time for him to climb the thirteen steps to the scaffold. One year before, just moments after killing Ruth, John’s first thought had been for a cigarette. Nothing had changed in the year since. John was still smoking as guards placed the black cap over his head. As he dropped he quipped: “Well boys, I got a run for this one.” The cigarette was jerked from his lips. Three witnesses, one of them a guard, fainted. John Joseph Malone was pronounced dead 12 minutes later. Jealously and gin make a lethal cocktail. 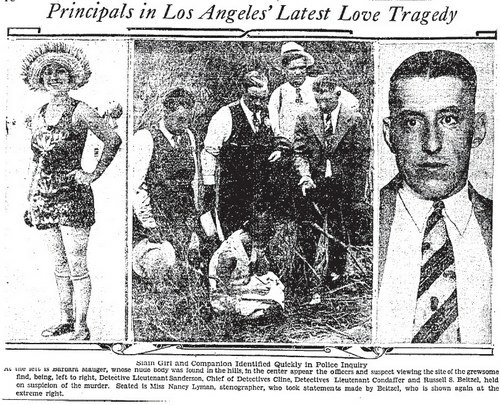 On September 10, 1927 a young couple, fueled by love and $300 (equivalent to $4200 in today’s money) in stolen cash, left Philadelphia for Los Angeles to start fresh. The money would last long enough to get them to Los Angeles and provide them with a stake sufficient to find a place to live and get settled. The pair moved a couple of times before they located the perfect apartment in a bungalow court slightly northwest of downtown at 841 Golden Avenue. New lives occasionally call for new identities, so the couple became Barbara and Russell Burnholme. Barbara was at home during the day while Russell was at work so the neighbors and local tradesmen got to know her the best. Barbara was well-liked by the people in her new life. She had a ready smile and a sweet manner and when it became evident that she and Russell were going to become parents the neighbors were thrilled for her. Their neighbors never thought twice about the reasons for the Burnholme’s move from Philadelphia to Los Angeles; hell, most people in L.A. were transplants. During her last trimester Barbara busied herself nesting, doing the sorts of homey things that young mothers-to-be frequently do when the birth of a child is imminent. She sewed baby clothes, fixed up the little apartment and planted flower boxes because she wanted everything to be perfect for the baby’s arrival. During the weeks leading up to her due date Barbara was given a kitten by the local grocer, the small Burnholme family was complete. 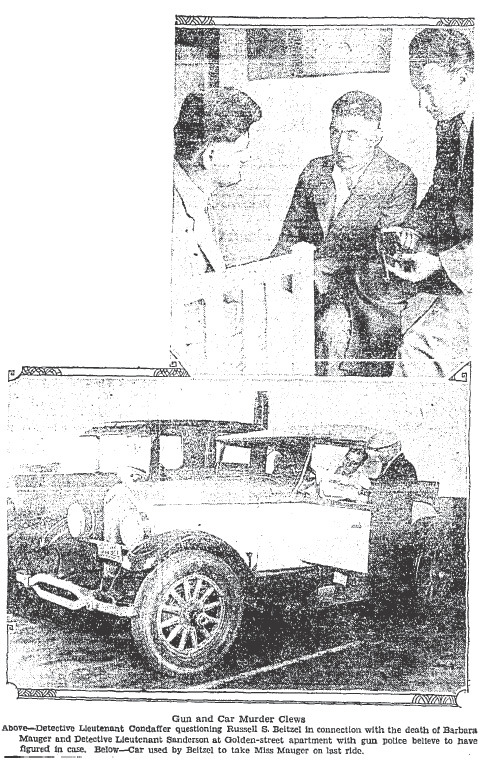 At 10:00 a.m. on June 24, 1928, Mrs. Morris Allen, one of the Burnholme’s neighbors saw Barbara and Russell getting into a rented roadster. It was a nice day for a Sunday drive and the parents-to-be were wise to take advantage of an opportunity to spend time alone, they might not have another chance for a long time. Russell had borrowed a gun from a friend and it was his intention to go out along a stretch of Mulholland Drive and shoot a few rabbits while Barbara put her feet up and enjoyed the summer air above the city. No matter how excited an expectant mother is about her future the last few weeks of pregnancy can be incredibly uncomfortable. Discomfort can lead to a short fuse and a flood of hormonal emotions. Often times a new father, especially if it is his first child, can be left scratching his head and treading on egg shells. Mrs. Allen lived across from Barbara and Russell at the bungalow court and she saw him return from the Sunday drive alone. When asked, Russell told his neighbors that Barbara had gone back east to have the baby; but that wasn’t the only story he told. Russell also told people that he and Barbara had quarreled during their Sunday drive and she had jumped from the car and had stubbornly refused to allow him to drive her home. It was quite a hike from Mulholland Drive to Golden Avenue, at least fifteen miles, and much of way home felt remote, even if the city lights could be seen twinkling in the distance. While the sun was still up hawks could be seen circling high in the blue skies waiting for the right moment to swoop down and make a meal of a rabbit or a mouse. After dark the mournful cries of local coyotes would shatter the silence and a person’s nerves; and the rustling of roadside brush would be unnerving as unseen creatures either hunted, or attempted to avoid becoming prey. If Russell had worried about Barbara’s safety it wasn’t enough to make him turn around and try to convince her to get into the car with him. Over the next few days Mrs. Allen heard Russell moving about the little apartment whistling, and she saw him wrapping up some bundles for mailing. Nothing sinister in that, right?